Inspired by the many garage sales going on in my neighborhood this weekend, I’ve created this free printable garage sale scavenger hunt. Make your treasure searching a little more fun by giving your kids this free printable and seeing how many items they can find (point out to you) as you explore garage sales around the city. Since every garage sale is different, this is a game that you could play again on another weekend. 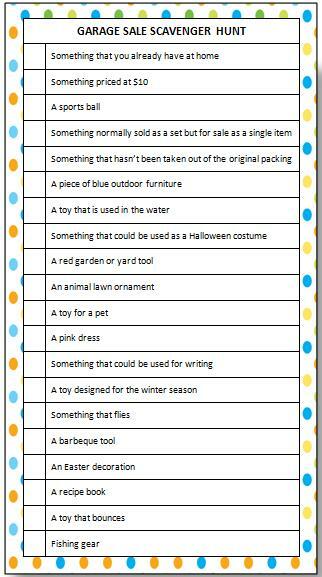 What other fun ideas would you add to this garage sale scavenger hunt list? When you visit garage sales, what types of items are you generally looking for? I’d love to hear the best purchase you ever made at a garage sale! Let us know in the comments below. Have Fun & Happy Exploring! For more ideas for family fun, visit our Free Printable Games page. We have scavenger hunts, charades, movie trivia for kids and much more. You can also stay updated on our latest ideas by following us on Facebook, Twitter, Pinterest or our new RSS feed Bloglovin’. Super cute – I wish there were garage sales where I am.